Happy New Year, dear readers! Welcome to 2015 – this past gaming year has flown by! 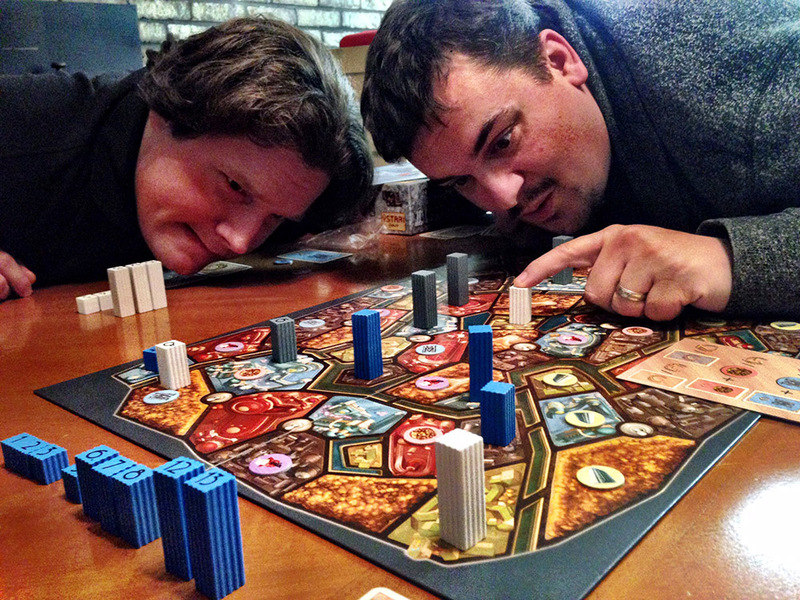 It was an amazing year for the boardgame industry, and we were lucky to be a part of it. With VivaJava Dice and Belle of the Ball reaching Kickstarter backers and retail with great enthusiasm, to Brew Crafters and The Rabbit card games being delivered to backers over the holidays, 2014 was truly a Dice Hate Me Games Year! And now it’s time on Dice Hate Me to look back at some of the best and brightest board games from 2014. This was a great year for board games, and it was a difficult decision in each category! To clarify the process of selection, the Game of the Year Award is open only to those games that were published and distributed for retail openly in the United States in 2014, and no Dice Hate Me Games titles are eligible. But, in order to honor those games that graced the gaming table for the first time this year but were published before 2014, I am continuing to announce the Dice Hate Me Discovery of the Year Award – and this year’s winner came in at the last minute. It was worth the wait. Anyone who knows the design aesthetic of the Dice Hate Me Games line can probably guess that I have a certain thing for Americana and history, and this particular game does not disappoint. Centered around a singular achievement in the annals of American lore – all controversy aside – Panamax has a certain amalgamated charm that is quite often rare in a somewhat-heavy, Euro-influenced economic game. Yes, you’re counting your beans, and, yes, you’re occasionally pushing some cubes, but what you’re also doing is pushing around some boats filled with dice through the locks of the Panama Canal which instantly triggers that inner child that used to insist his favorite tug boat was in the tub at bath time. In my mind what sets Panamax apart from the average economic, bean-counting, cube-pushing engine is – aside from a realistic integration of theme – that within this Euro beast lies an incredibly intuitive social heart. You’re not always going to be working against your fellow corporate competitors; sometimes it’s beneficial to set your greed aside and agree to work together to get those boats through the locks as quickly as possible. Invest wisely, choose your actions carefully, and load those dice the best way you know how and you’ll soon be a shipping superhero. If only our boardgames could get delivered as efficiently. Panamax is a game for 2-4 shipping magnates, ages 12 and up, by Gil d’Orey, Nuno Bizarro Sentieiro, and Paulo Soledade for Stronghold Games in the US. Quite often with the Dice Hate Me Game of the Year Awards there seems to be a front-runner that rears its head around August and gives the other games a run for their money for the rest of the year. This time around it was Imperial Settlers. Designed by Ignacy Trzewiczek, and based on his former engine from 51st State, Imperial Settlers is a card combo engine builder set to Beast Mode. In the game, you choose one of four factions – Barbarians, Romans, Egyptians, and Japanese, each with their own unique specialties – and proceed to spend the next hour and a half figuring out the best way to use your people, resources, and weaponry to pillage, produce, and protect your homeland. Imperial Settlers manages to capture that intangible, magical feeling you get when you manage to activate an incredible string of events that makes your opponents ooh, ahh and reel in terror – and therein lies its undeniable charm. In previous years it seemed easy to choose the Game of the Year; this year, it was a last-minute gut check. But, I have no doubt that Ignacy, and Portal Games, are going to give every company that comes forth a run for their money in 2015. Imperial Settlers is a game for 1-4 colonials, ages 10 and up, from Ignacy Trzewiczek for Portal Games. Ah, NASCAR. For a select demographic that acronym evokes a certain stereotype that conjures images of drunk, Bud-drinking rednecks woohooing as they spy their favorite number whipping around a circular track at 180+ miles per hour. For others, that stereotype is a concrete reality. I grew up amongst the latter. You see, my hometown is Richard Petty’s hometown, and for those not in the know, Richard is the officially-crowned King of NASCAR. While fast cars are definitely in my blood, stock car racing must not have taken hold in my particular genetic makeup. At GrandCon in Michigan, Richard Launius mentioned that it was his favorite game of the year and that he just so happened to have it in tow. Who am I to resist racing stock cars with Richard Launius? And so he, Darrell Louder, Marc Specter and I captained our team of cars around the oval track for a couple of hours – and it was pure adrenaline, card-flipping bliss. Thunder Alley is a game that transcends the theme around which it is surrounded – anyone can enjoy and understand the mechanics and social interaction. You don’t have to know the vagaries of drafting, pitting, shifting, and shimmying, you just have to know when to yell out “boogity boogity” at just the right time and gun it toward the finish line, engine be damned. That, to me, is what racing – and playing a racing game – should truly be all about. Thunder Alley is a game for 2-7 racing enthusiasts, ages 10 and up, from Jeff and Carla Horger for GMT Games. Five Tribes (Bruno Cathala again proves himself the master of the memorable game, using the Mancala mechanism to the best effect in years), Black Fleet (Space Cowboys hits another one out of the park with this pirates-and-plunder title that has an exciting, yet convivial, take-that title in the same vein of Survive), Diamonds (Veteran game designer Mike Fitzgerald reinvents classic trick-taking games for a modern age; easily a Game of the Year for casual groups of all ages and gaming types – this one is not to be missed, trust me. Find it.). Anyone who regularly listens to The State of Games podcast knows that I chastise TC Petty III for his incessant adoration of abstract games. Occasionally he brings around one and assures me that “this one is different”, and that I’ll love it. Well, I’m here to tell you all, dear readers, that this one is different. And I love it. At its core, Metropolys is an abstract, area-control behemoth, but what sets it apart are the components and the bidding. Everyone has a set of buildings of three different sizes, all crowned with a set of numbers. Your goal is to use those buildings as best you can to outbid your opponents for just the right spot in the city from turn to turn. Use your high-value buildings too early and you fall to the whimsy of your opponents. But bid and bluff right according to what you think your opponents’ secret object might be and you just might be crowned king or queen of Metropolys. I don’t normally choose a game that’s out of print for my Discovery of the Year, but this one is worth tracking down – after all, it’s from Sebastien Pauchon, the designer of Yspahan. And all of you dear readers should know by now that that game is a must-have in every game library. So is this one. Go get it. Occasionally I come across a game that it seems everyone and their brother has played and which I have not. Coloretto is certainly one of those games. 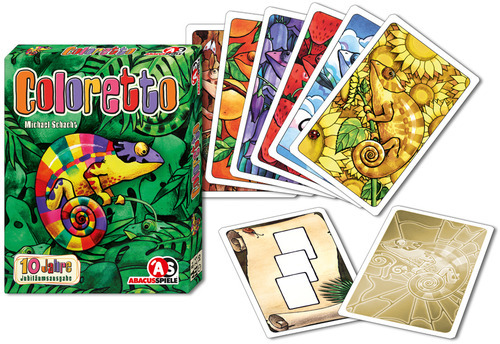 Talked about in not-so-hushed whispers in every gaming circle, Coloretto might be considered a grail game – one which is so simple in design, yet so enriching and rewarding in gameplay. I’m here to tell you that this is true. There are columns set out depending on the amount of players. On each turn, you decide if you’re going to flip a card from the stack or take one of the columns. The caveat: You’re trying to enrich up to three sets of colors, and no more, to enhance your score. Collect colors over those three and you incur penalties. It’s that easy – and ridiculously awesome. Definitely in the same class as No Thanks!, Coloretto is one of those games that makes you stop and think how anyone came up with the concept… and how you might just stumble upon your own grail design somewhere down the trail. I am sometimes surprised by a game, and that is a very good thing. Coal Baron did this. Bought at BGGCon by Darrell from R&R Games, I didn’t really give Coal Baron much of a chance based on its theme and presentation. I am happy to admit that I was dead wrong. In Coal Baron you work to enhance your coal empire by placing workers, drafting mining contracts, and collecting tiles that enhance and expand your coal mine. On the surface, it acts like many other worker placement games; at its core lies a very enriching game that falls somewhere between a filler and a medium Euro. What sets it apart is how easy it is to pick up, and how enriching it is to play. 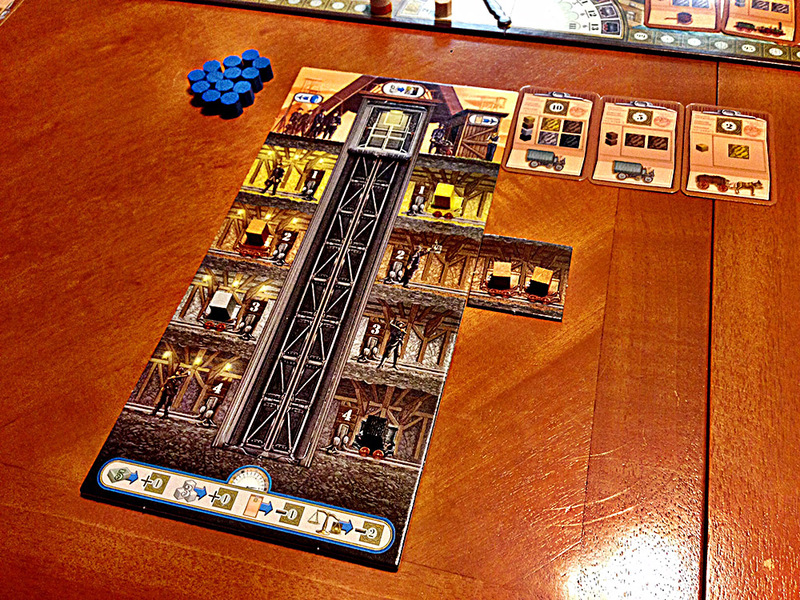 Also helping to round out that X-factor that makes you remember a really good game are subtle component choices – most notably the variable-depth punchboard that makes up the coal shaft and allows your elevator to easily slide up and down from the depths of your mine to the top. Carefully-considered touches make this an approachable game that should be on many gamers’ shelves, and make it easy for me to recommend on my Game of the Year list. Rhino Hero (yet another wonderful stacking game meant for children, but thoroughly enjoyed by adults, from the Germany-based HABA, which is, thankfully, expanding even futher into the US), Suspend (again, another stacking and balancing game, featuring wire forms in various shapes from the amazing Melissa & Doug). Thanks for your love towards Thunder Alley. We are glad that so many people have enjoyed it this year. Hopefully our 2015 games meet the Thunder Alley standard.